I followed this road and Google Street View for some reason stops short of the inhabited area a bit ahead (maybe because there was a temporary no entry sign for the time of a construction). It seems that there is just a short connection between that point and the buildings. 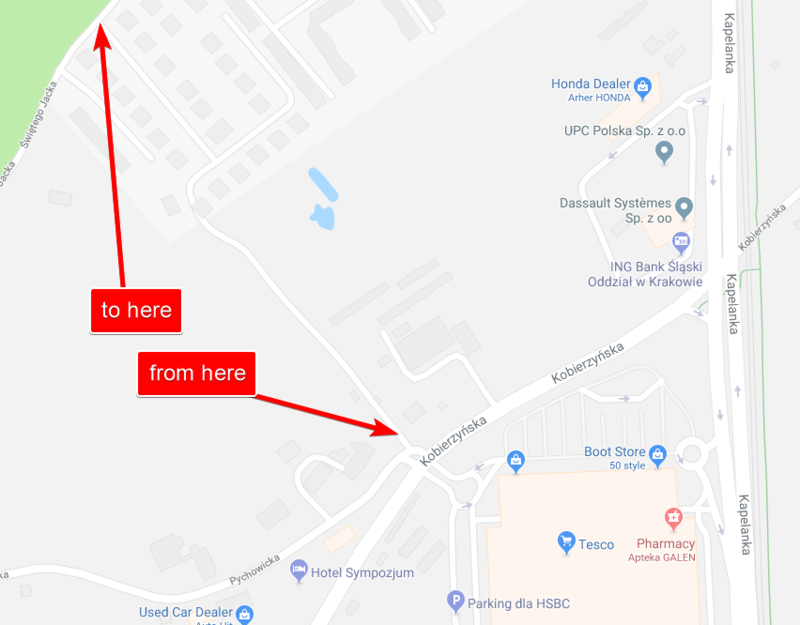 I've seen quite a few such areas when bicycling in Eastern Europe and it looks to me as if it is a private, not publically accessible estate. That is confirmed by the signage on the other side (where your 'to here' arrow is pointing). The estate entry is secured with a gate (although open when the street view images were taken) and there is a dead-end sign with the text 'private area - no throughfare'. I would be surprised if you would not also run into a gate before approaching the estate from the other side, passing beyond where the Google Street-View footage ends. It is in Eastern Europe not uncommon that upper-class housing is built in fenced-off estates, allowing access only to residents and genuine visitors. Both Google Maps and Open Street Map often fail to identify these estates as such and they are simply shown on the map as regular residential areas with seemingly accessible roads. The high-resolution imagery shows a lane for the entire path. Where the Street View ends, the sign on the right says 'Construction Site' 'No Trespassing'. It looks like the construction is done, so the lane probably does goes through now. From this data: There is no road there, just a foot path. And there are several gates along the way. Not the answer you're looking for? Browse other questions tagged driving poland krakow or ask your own question. How to find a cheap tour to Wieliczka salt mines from Krakow?